This detached residence occupies a pleasant location at the head of a private driveway that serves just a handful of prestigious homes and takes in some fabulous long-distance views. The property was constructed in 2001 for the current owners who have just finished a further programme of updating, redecoration, and newly laid carpets in most areas. FULL DESCRIPTION This detached residence occupies a pleasant location at the head of a private driveway that serves just a handful of prestigious homes and takes in some fabulous long-distance views. The property was constructed in 2001 for the current owners who have just finished a further programme of updating, redecoration, and newly laid carpets in most areas. There are 4 generously sized double bedrooms which makes this an ideal family home in a great location, with easy access to the M62 at junctions 23 or 24, or if you rely on public transport, you will find a railway station in nearby Slaithwaite where you can catch the trans Pennine trains, or opt for one of the local bus services. Externally there is a block paved parking area, access to the integral double garage, access down the side of the house to a good-sized paved patio, raised garden area, and couple of steps up onto the newly constructed decked terrace where you can sit and relax or entertain your guests whilst enjoying superb views across the adjoining fields and far beyond towards the Pennine hills. GROUND FLOOR The front entrance door with glazed panel is set into a much larger glazed unit which provides plenty of natural light into the reception hall. RECEPTION HALL A light and airy hall having lots of light and being open to the galleried landing and exposed roof timbers above. It is finished with a tiled floor, and dado railing. 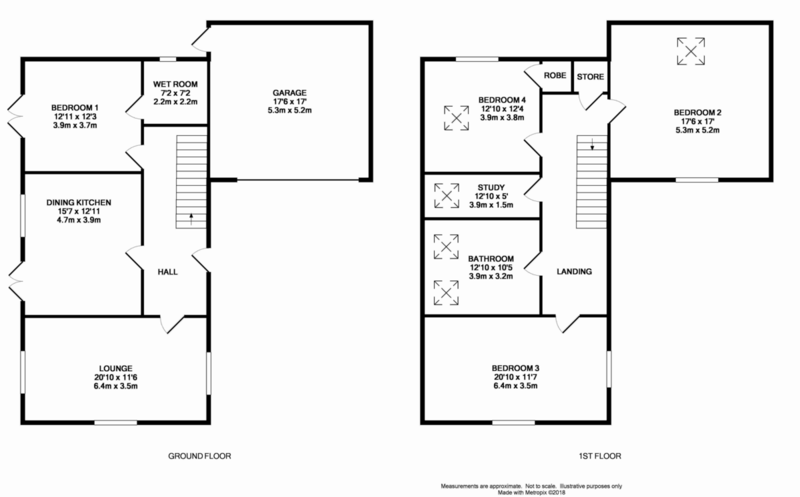 LOUNGE 20' 10" x 11' 6" (6.35m x 3.51m) A pleasant reception room with windows to 3 elevations offering far reaching views. There is a 'Waterford' multi-fuel stove set into the chimney breast with a chamfered stonework surround, a stone back and hearth, and enhancer lighting. The lounge also has dado railing, and intricately worked coving and ceiling detail. DINING KITCHEN 15' 7" x 12' 11" (4.75m x 3.94m) A good-sized dining kitchen fitted with a range of oak fronted wall, drawer and base units with ample granite work surfaces over incorporating a 1½ bowl ceramic sink with mixer tap. There are matching illuminated glass fronted display cabinets, and shelved displays. Appliances include a 4-ring induction hob with extractor hood over, electric oven & grill, dishwasher, wine cooler, and fridge/freezer. The kitchen also has tiled splashbacks, tiled floor, ceiling spotlights, under unit enhancer lighting, window and French doors to the rear with views towards Wessenden Moor. There is ample space for a dining suite. BEDROOM 1 12' 11" x 12' 3" (3.94m x 3.73m) A well-proportioned bedroom fitted with a range of wardrobes, cupboards, and bedside units. There are French doors out to the rear, ceiling spotlighting, and timber effect flooring. EN SUITE WET ROOM 7' 2" x 7' 2" (2.18m x 2.18m) Newly finished is this stylish wet room comprising a low flush w.c., twin wash basins on a 'floating' drawer unit, and a large fixed shower head with an additional flexible shower hose over a fully tiled wet room floor. There is an extractor fan, frosted window, ladder style radiator/towel warmer, ceiling spotlighting, and fully tiled walls. LANDING With wooden balustrading, newel posts and handrail forming a gallery over the reception hall below. The landing is open to some impressive roof timbers, has ceiling spotlighting, and access to a walk-in linen cupboard. BEDROOM 2 17' 6" x 17' 0" (5.33m x 5.18m) A substantial double bedroom with a velux window and views through the dormer window at the front. BEDROOM 3 20' 10" x 11' 7" (6.35m x 3.53m) Another large double bedroom with ceiling spotlighting, and windows to two elevations providing pleasant views. BEDROOM 4 12' 10" x 12' 4" (3.91m x 3.76m) Even this fourth bedroom is a good-sized double with window offering views to the rear. There is a built-in cupboard with hanging rail, and there are ceiling spotlights. STUDY 12' 10" x 5' 0" (3.91m x 1.52m) An ideal home office with a velux roof window, and access to the loft. HOUSE BATHROOM 12' 10" x 10' 5" (3.91m x 3.18m) A much larger than average bathroom fitted with a white suite comprising an exceptionally large bath with mixer tap set into a slightly raised and tiled surround, large shower cubicle with Grohe shower over, pedestal wash basin, and a low flush w.c. This spacious bathroom also has an extractor fan, ceiling spotlighting, tiled walls, wood effect flooring, ladder style radiator/towel warmer, and two velux roof windows. OUTSIDE The property is accessed up a private sweeping driveway which serves this and a handful of other prestigious homes and No.1 is the last one right at the top of the drive where you will find a block paved parking area giving access to the integral garage, front entrance door, and paved area at the side of the house. At the rear, you will find a sizeable paved patio, access to a raised garden, and a couple of steps up to a good-sized decked terrace with metal balustrade sections between wooden newel posts, and inset 'dusk-til-dawn' LED enhancer lights. The rear patio and terrace are ideal for outside entertaining with direct access into the dining kitchen, and from where you and your guests can sit and take in some breathtaking views. LOCATION From the roundabout at Outlane/junction 23 of the M62, take the A640 (New Hey Road) signposted for Rochdale and follow the road through Outlane village and up the hill. Turn left onto Round Ings Road proceeding up the hill and once at the sharp righthand bend at the top, take the second road on the left onto School Road. Proceed down the hill to the crossroads in Scapegoat Hill and with the Scape House Inn on your right, go straight across onto Pike Law Lane. Follow the lane down and just before you get to the junction at the bottom of the hill, turn up the private driveway on the right and No.1 is right at the top.